Would you be able to choose between the Nikon D500 and the Nikon D850? It’s not easy to draw the line between these top-of-the-line Nikon cameras. They both produce such beautiful images and offer such a wealth of premium features. If you stack them up against each other, does a clear winner emerge? Read on to discover which of these two incredible cameras we recommend for experienced photographers. Before we dig into the ways these two cameras differ, let’s take a few minutes to explain their shared strengths. There are hundreds of options on the market today. So it’s important to remember that these are two amazingly powerful and versatile machines. One of these cameras probably better suits for your shooting style and preference. However, you won’t regret purchasing either. Both cameras have the same 3.2-inch, 2.359k-dot LCD screen. It responds to the touch of your finger. It also tilts to give you a perfect view of your subject. If you prefer to stay connected on the go, then you’ll love that both cameras connect to Wi-Fi and Bluetooth. Neither camera implements an anti-aliasing filter. So they’re guaranteed to reproduce stunning colors and details. That is the case regardless of the shooting situation. The D500 and the D850 are both excellent choices for the photographer who wants to elevate their craft and expand their horizons. The Nikon D850 boasts truly astonishing imaging power. It’s a true professional’s camera. It boasts a full-frame 45.7 megapixel BSI-CMOS sensor. That captures scenes and subjects in sharp and exquisite detail. Once you see the brilliance and clarity of the images this camera produces, you just might find it impossible to resist. The Nikon D500, to its credit, shoots lovely images on its 20.9 megapixel APS-C CMOS sensor. It always produces enough richness, depth, and detail to put similarly priced cameras to shame. Unfortunately, it just can’t keep up with the pixel-packed D850 when it comes to image resolution. 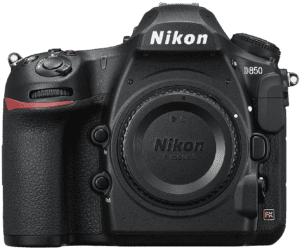 The Nikon D850 is a full-frame DSLR camera. So you’ll have the whole range of Nikon D850 compatible FX lenses at your fingertips. That means access to some of the most iconic full-frame glass on the market. It includes the legendary Nikon 24mm f/1.4, the 135mm f/2, and more. The list goes on and on. Each Nikon lens is more brilliant than the ones before. And dozens of awesome lenses are released every year. However, you shouldn’t fork over extra cash for a full-frame camera if you don’t want to sink serious money into your lens kit as well. The D500 might not offer the same state-of-the-art lens selection. However, there are plenty of options available for the budget-conscious photographer. It’s always far smarter to invest your money in great lenses than an expensive camera body. Nikon offers dozens of incredible DX lenses at affordable prices. Both cameras offer a luxurious 153 autofocus points, although you can scale that number back for shooting situations that don’t require as much precision or accuracy. 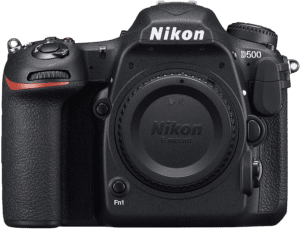 The Nikon D500 allows you to shoot with 25, 72 and 153 points; the D850 offers the same options, but also adds a simplified 9-point setting when you want to declutter your viewfinder even further. The Nikon D500 and the Nikon 850 also both feature 99 cross-type points, which are perfect for locking onto your subject and finding the perfect balance of foreground and background. However, the D850 does offer a bit more flexibility in tricky shooting situations (this is an upgrade over the D810, as well). Its 3D-tracking feature makes it easy to keep subjects in clear view, and its advanced group-area AF functionality is perfect for zeroing in on fast-paced athletes and wildlife. Shooting speed is one area in which the Nikon D500 accelerates past its newer rival. In burst mode it can shoot both RAW and JPEG files at 10.2 frames per second, while D850 only manages 7.1 frames per second. It may not seem like much, but those few extra frames can spell the difference between a successful session and a total flop. It’s every photographer’s worst nightmare: you’ve found the perfect location, you’ve recruited an enthusiastic subject, and you’ve finally hit your groove. Then you see the low battery light flashing on your screen and need to head home. Thankfully, camera battery technology has come a long way in just a few short years, and these high-end Nikons take full advantage of that progress. The Nikon D850 can capture an impressive 1840 still shots on a single charge, while the D500 manages 1240 shots. You can shoot continuous video for around 70 minutes with the D850 will start to run low at the 50-minute mark. If you’re planning to shoot 4K video—which both cameras can do—then pack extra batteries and plan to run dry a little more quickly than usual. Sometimes you’ll achieve more professional results with a lightweight, user-friendly camera that doesn’t have as many advanced features. The most useful camera in the world, for beginner photogs and pros alike, is the one that you’ll stash in your bag when you leave the house and reach for whenever you see an inspiring subject. The Nikon D500 has a slight edge on its competitor in this category. It’s a little lighter than its competitor—weighing in at just 850 g, in comparison to the D850’s 1015 g—and it won’t take up as much space in your camera bag. You’ll also want to keep in mind that the weight of the body is just one factor in determining whether a camera is lightweight enough to haul around all day. Heavy, bulky lenses can add a lot of weight to your camera and a lot of discomfort to your day. Since the D850 has a full-frame sensor, the FX lenses fitted to its mount generally weigh more than their DX counterparts. Although both cameras showcase innovative designs and superb functionalities, each one is better suited to a different set of needs and priorities. Investing in the Nikon D850 means committing to an expensive and sometimes confusing full-frame lens system. Quick note: the D850 does not have a built-in flash, so be sure to invest in a speedlight for those tricky shots where you need a fill on a sunny day. You can save thousands by opting for a slimmer kit—but you’ll also say goodbye to a handful of incredible features. That’s why we would choose the Nikon D850 over the D500 any day. This high-performance powerhouse has earned its stellar reputation for a reason.